Sunglows are hypomelanistic albino boas. What sounds very curious makes sense at the end. Hypo boas have a reduced black pigmentation which is completely lacking in albinos. The hypo genetic not only decrease the black-allotment, peculiar it’s brighten up every colour and causes that the colours become clearer and more brilliant. 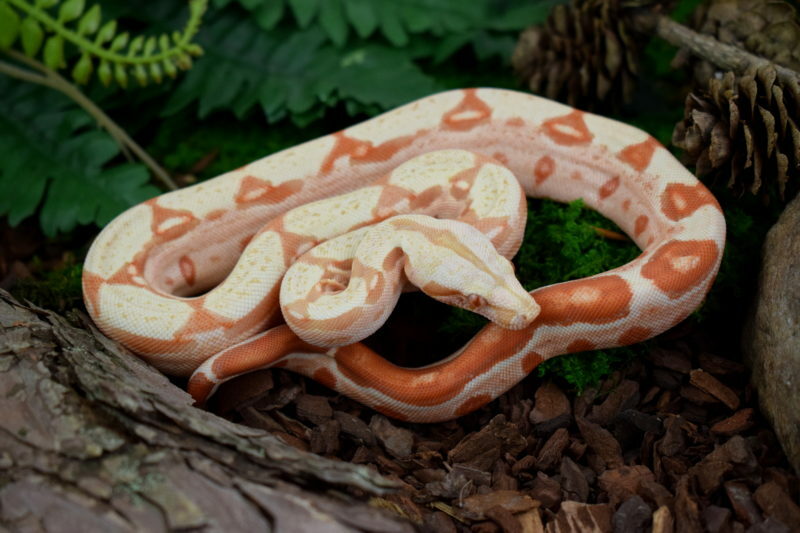 Hence the pattern of the sunglow exhibit a clear intensively red and also the verges of the blotches on their backs are far cleaner and sharper defined as by the normal albino boas. Altogether the look is fundamental more colourful and also the blotches are in most cases much smaller. 50 % are normal boa’s het. for albino. If you cross a sunglow with a third mutation it becomes even more interesting.